The developer community in Kolkata remained cautious of the end-user need and hence restricted thetemptation of hiking prices of their projects. This led to improved sales volume in the latter half of theyear. Orthodox pricing by developers also ensured limited growth of average capital values in the city during Oct-Dec 2015 as compared to the preceding quarter. Kolkata witnessed new project launches in the affordable housing segment (Rs 20-40 lakh), thereby limiting the average capital growth in the city. Developers consciously altered their product offerings to cater to the growing demand for affordable and mid-segment housing. Sales picked up in the last two quarters of the year. Industry reports revealed that Kolkata was the only major city to have witnessed improved home sales in the last quarter. The smart city project infused enthusiasm and buoyancy in the real estate market of Kolkata. The city has already submitted the plan for the smart city project seeking inclusion of localities such as New Town, Salt Lake, Durgapur and Haldia in the list of first 20 townships to receive approval and funds. Work in this direction has already begun in New Town, which includes use of pollution-free devices, developing green buildings and using smart public transport system among others. The New Town Kolkata Development Authority has announced incentives for developers who would deploy green technologies in their residential projects in the area. Further, there is a proposal to introduce monorail in New Town to enhance inter-city connectivity. Several measures to upgrade infrastructure in the city were announced in the last quarter of the year. For instance, West Bengal requested the World Bank for a soft loan of Rs 4,000 crore to complete projects like the rural housing scheme and the rural road networking project. A cement company is set to start operations in Singur, just 40 km away from the city center. At a time when cost of raw materials is on the rise, this comes as a relief for the real estate sector in the city. Even though the absorption of residential units gained momentum in the city during the second half of the year, the capital market remained stable in the absence of any price hike by the developers. Availability of land in North Kolkata aided developers to construct projects that fit the budget requirements of a major chunk of home buyers. 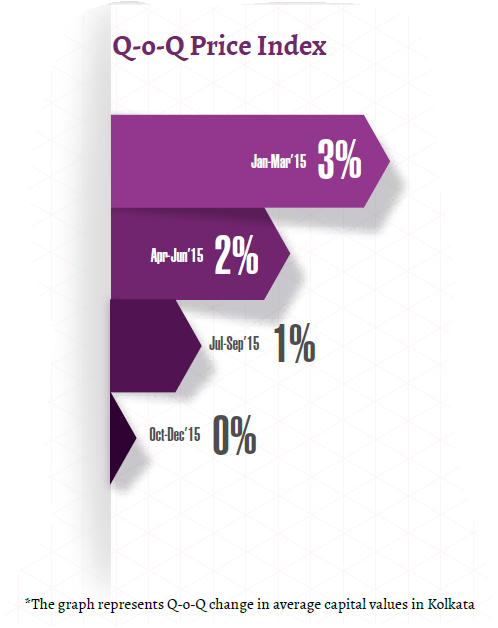 Thus, the northern part of the remained active with increased number of tractions in the Oct-Dec 2015 quarter. Micro markets in the North such as Dum Dum, Sodepur, Ultadanga, Baranagar, VIP Road and Durganagar clocked an average price rise of four to eight per cent in capital values in the last three months. Affordable residential inventory priced in the range of Rs 2500-4000 per sq ft pushed demand up in these areas. New Town has always been a preferred residential option owing to its impeccable planning and the presence of IT hubs in the vicinity. The real estate market in the locality has been buoyant on the back of the smart city nomination. This has pushed the ‘ask’ rates up by four per cent in the last three months. The proposal to have monorail connectivity is seen as an added attraction. Residential pockets along the EM (Eastern Metropolitan) Bypass witnessed strengthening of prices in the last quarter of 2015. The widening of the corridor to a 12-lane expressway added to its residential appeal. Kolkata Municipal Corporation (KMC) decided to lay a dedicated water pipeline to supply filtered water to all major complexes along EM Bypass. Localities along the stretch such as Garfa, Kasba, Picnic Garden, Patuli and Santoshpur recorded a rise of one to three per cent in capital values on this account. The rental market in Kolkata remained relatively more buoyant as compared to the capital market. The average rental values in the city grew by two per cent in the last one year (Oct-Dec 2015 vs. Oct-Dec 2014). More than 50 per cent of the tracked localities recorded a rise in rental values in the range of five to 11 per cent during Oct-Dec 2015 as compared to Oct-Dec 2014. Localities offering easy connectivity and proximity to IT hubs continued to be preferred as rental destinations. Most of these were in the South and North zones. 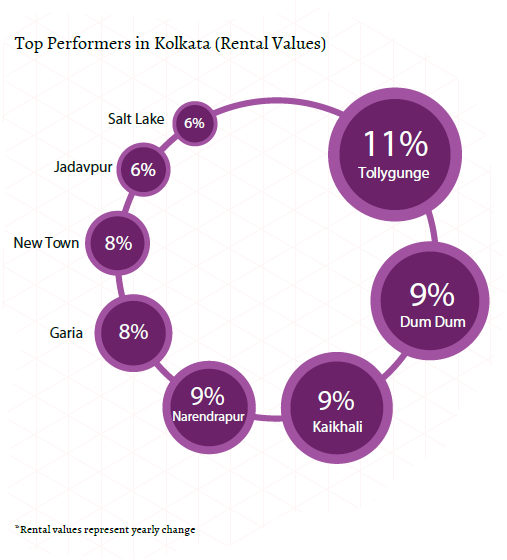 Tollygunge registered the highest rise in rental values in the city over the last one year. Owners were reluctant to reduce the ‘ask’ rate as the location offers excellent connectivity through road and Metro. Moreover, proximity to Jadavpur, a premium area, also adds to its charm. Locations along EM Bypass and its extension witnessed a mushrooming rental market. These include places such as Garia and Narendrapur. These locations recorded a rise of eight and nine per cent, respectively in rental values since Oct-Dec 2014. Price competitiveness and metro connectivity have been common factors driving rental demand to Garia and Narendrapur from the tenant community. The underlying residential appeal of premium and highly-priced localities like Salt Lake and New Town ensured a healthy rental demand in these areas. Rental values in these localities witnessed a rise of six to eight per cent in the last one year. Affordable and mid-segment properties dictated the dynamics of the Kolkata real estate market in the last three months of 2015. Developers focused on building 2BHK units to gratify the need of the buyer community, who looked for properties largely in the price bracket of Rs 20-40 lakh. 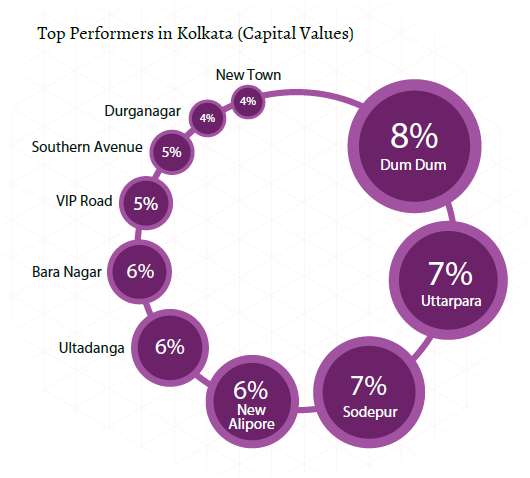 Apartments continued to capture more than 80 per cent of the total market share of listed properties in Kolkata during the Oct-Dec 2015 quarter. However, the segment witnessed a slight drop of three per cent in its supply in the current quarter as compared to Jul-Sep 2015. Due to the prime demand for budget housing options, developers concentrated on completing apartment projects rather than independent homes or villas, which hurt the buyers’ pockets more than the former. Out of the total residential stock available in each zone, apartments captured more than 95 per cent of the market in East Kolkata while nearly 85 per cent of the inventory in North Kolkata was available in apartment projects. Central parts of the city witnessed limited new launches. More than 75 per cent of apartments in the zone, thus, were ready to move. 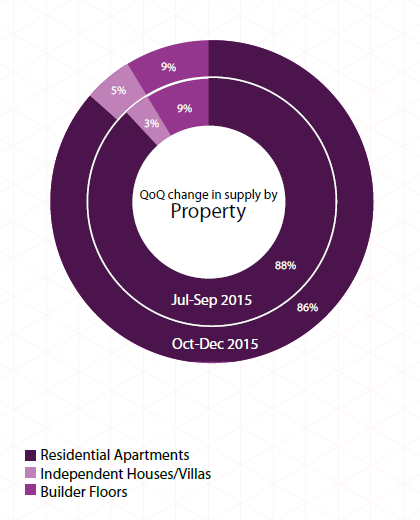 Supply of independent homes/villas inched up marginally in the city during Oct-Dec 2015 quarter as compared to the quarter ending September 2015. The launch of a few villa projects in the eastern part of the city edged up the supply in the segment. Supply in the builder floor segment remained dormant in the last six months as buyers looked for gated communities that offered more amenities for the same price range. As witnessed in the last quarter, supply in the category settled at nine per cent. Lower disposable income of property buyers in Kolkata as compared to other major cities limited developers from expanding the price range of their projects beyond a point, opine experts. Realizing the inherent demand for affordable and mid-income housing categories, developers in the city have shifted focus towards building houses in the Rs 20-40 lakh category. To boost traction, developers consciously tried to deliver units in the said budget range. 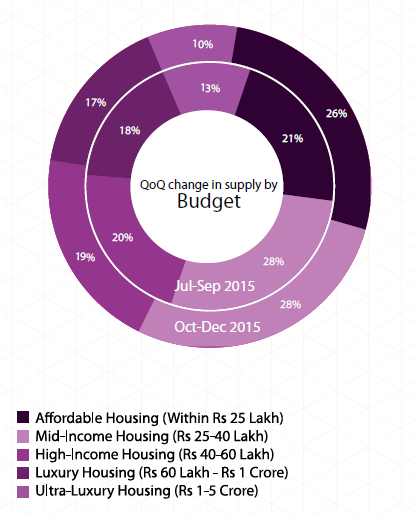 Thus, supply in the segment grew by five per cent in Oct-Dec 2015 quarter as compared to the preceding one. Due to the easy availability of land parcels, developers found it easier to offer properties within Rs 25 lakh in North Kolkata. The zone recorded the highest supply of properties in this range. Locations such as Baguihati, Madhyamgram, Barasat and Kestopur recorded the maximum affordable projects in the city. Properties within the price range of Rs 25-40 lakh were largely concentrated in South Kolkata in locations such as Garia, Behala and Narendrapur. As developers focused on building and completing affordable projects, supply of ultra-luxury housing (Rs 1-5 crore) suffered. Supply in the category witnessed a drop of three per cent in the last three months. Developers in Kolkata have been concentrating on reducing the ticket size of their offerings in the last six months. 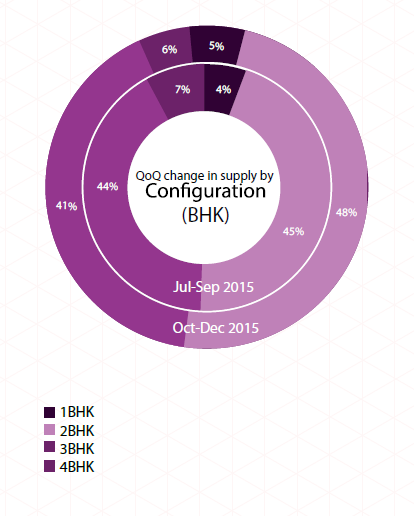 This translated into a rising supply of smaller housing units in Oct-Dec 2015. While 1BHK units recorded a marginal rise, 2BHK units noted a three per cent growth in supply during the last quarter of 2015. Experts claim that the size of 2BHK units has shrunk over a period of time. Developers now offer a 2BHK unit sized at750-850 sq ft instead of 900-1000 sq ft to meet the budget requirements of the clientele. Supply of larger homes noted a downward curve as buyers and developers kept away from the segment. Thus, supply of 3BHK units recorded a drop of three per cent to capture slightly more than 40 per cent of the total market share as compared to 44 per cent recorded in the previous quarter. The 2BHK category formed the most supplied configuration across all zones except in Central and East Kolkata, where 3BHK units dominated the market supply. Smaller units configured as 1BHK remained out of the radar for both buyers as well as developers as the segment was the least supplied across all zones with five per cent availability. Even larger formats (4BHK units) recorded a tepid response in the market and hence witnessed limited supply at just six per cent. 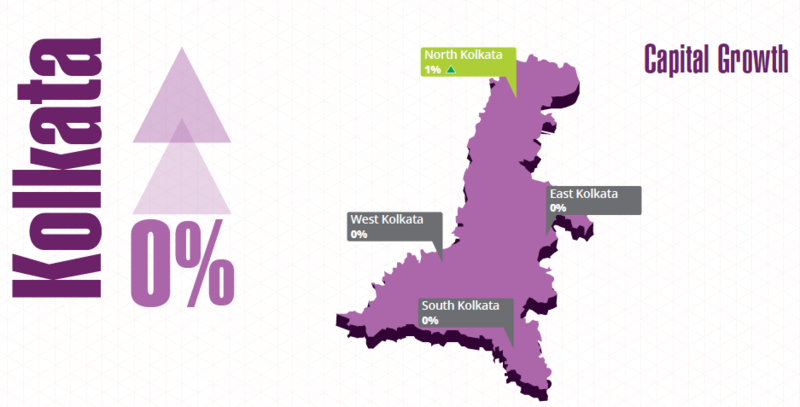 Ready-to-move-in properties made up almost 60 per cent of the total market supply in Kolkata in Oct-Dec 2015, recording a growth of three per cent from the last quarter. The market was flooded with ready units as developers concentrated on completing pending projects. This was in line with the buyer demand. Developers have been holding back their new launches which explains the drop in supply of under-construction properties. 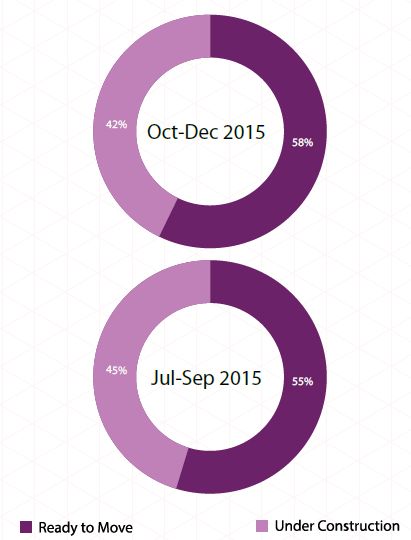 As more and more developers started giving possession, the percentage of under-construction properties dropped to about 40 per cent by the end of the year (Jan-Mar 2015 vs. Oct-Dec 2015). Nearly 50 per cent of the ready units were configured as 2BHK units, again indicating that the supply in the market is highly aligned as per the buyer demand. Most of these units were concentrated in South and North Kolkata. While independent houses/villas had a 4:1 ratio for ready vs. under-construction properties, almost 95 per cent of the builder floors in the city were ready-to-move-in. Interestingly, only 50 per cent of the apartments were ready to occupy, attesting that most of the new launches are in this category.